Platteville, WI. — Melby Funeral Home in partnership with the Northwoods Casket Co. will plant five trees at the Belmont School on Tuesday, October 30th. Three oak and two maple trees will soon provide shade at the beautiful school. In years to come these trees may be the subject of children’s drawings and paintings or serve as “safe zones” for a friendly game of tag during recess. This is the first of many annual plantings Melby Funeral Home has planned for the area in cooperation with the Northwoods Casket Company of Beaver Dam, Wisconsin. Matthew Melby, owner of Melby Funeral Home says, “When I first met Julie and Jonas, I simply knew this would be a long-term relationship, that we’d be in business together for many years, and we’d plant many trees together for our communities to enjoy." The Northwoods Casket Co. facilitates a statewide tree planting initiative by donating trees to Wisconsin communities and sponsoring reforestation projects on public lands throughout the state of Wisconsin. These donations are part of the Beaver Dam company's commitment to plant 100 trees for every casket it builds. With the help of the Department of Natural Resources and local funeral homes like Melby Funeral Home, the company has helped organize tree plantings in Beaver Dam, Sheboygan, Minoqua, Jefferson, Wonewoc, Blanchardville, and Belmont. Olivia Witthun, DNR Regional Urban Forestry Coordinator who helped organize several of these planting events shares, "This partnership is about planting a legacy. These communities and their residents will reap the benefits of these trees for years to come." In addition to the urban forestry donations, the Northwoods Casket Co. funds reforestation projects with the DNR with one such project in the Kettle Moraine State Forest Northern Unit in Sheboygan County in 2012. According to Patricia Murphy, the Regional Forestry Supervisor, "Northwoods Casket's funding will help plant approximately 10,000 seedlings, or about 10 acres, and will be part of a larger reforestation project in the state forest." The new stand of forest will consist mostly of cherry and mixed oak trees. Northwoods Casket Co. has built a casket business primarily focused on Wisconsin funeral homes. The company is committed to sustainability by crafting caskets from locally sourced, sustainable woods adorned with non-toxic finishes, natural oils, and VOC-free natural wax and oil wood finishes. Casket interiors are made from biodegradable, natural cotton, and other environmentally friendly fabrics made from hemp, flax, and wood pulp. Styles range from historic to contemporary. Above all, founders Jonas and Julie Zahn have committed to plant 10 million trees in their lifetime and plant 100 trees for every single casket the company builds. “Planting trees is a core element of our business. Planting 10 million trees is more than a commitment to the good people of Wisconsin—it is a promise I have made to my two children,” says Jonas Zahn. Established in 1865, Melby Funeral Home has been serving Platteville area families for more than 150 years. Current owner, Matthew Melby, is an avid supporter of local tree-planting and sustainability. About the Northwoods Casket Co. The Wisconsin company, founded in 2006, builds locally sourced wooden caskets and delivers to every funeral home in the state of Wisconsin with next-day delivery service. The company builds a wide selection of caskets in 50 styles and finishes suitable for cremation or burial. For more information go to www.northwoodscasket.com or call (920) 631-7077. Beaver Dam — “We’re a tree planting business that happens to build caskets,” said Jonas Zahn, who, with his wife Julie, owns Northwoods Casket Company. Jonas Zahn pictured with a 100% metal free pine casket--one of more than 75 different styles the company crafts here in Wisconsin. Jonas grew up on a dairy farm and had a 20-year career in the corporate world, but he and Julie started this business as a way to satisfy his desire to provide something that will benefit generations to come. Former U.S. Senator Russ Feingold is visiting new businesses and entrepreneurs across the state of Wisconsin in preparation for his upcoming bid for Wisconsin Senate in 2016. Feingold spent a few hours in Beaver Dam during the quiet hours of the afternoon on Sunday, July 5th with Northwoods Casket Co. founders Jonas and Julie Zahn and Black Waters Coffee founder, Josiah Vilmin. Feingold is looking for entrepreneurs with new ideas and new businesses in Wisconsin--the kind of people and ideas that will bring new industries to our state and create jobs for Wisconsin in the coming decades. Russ Feingold learning about an historic 100% non-toxic "limed oak" finish on a casket made from locally sourced, sustainable Wisconsin red oak. Urban Forestry Council Awards Northwoods Casket Co. for "Innovations in Urban Forestry"
Jonas Zahn, Northwoods Casket Co. founder, accepts the “Innovations in Urban Forestry” award from Jeffrey Treu representing the Wisconsin Urban Forestry Council. Beaver Dam, WI. The Wisconsin Urban Forestry Council presented Northwoods Casket Co. owners Julie and Jonas Zahn with an award for “Innovations in Urban Forestry” recognizing the company’s commitment to plant 100 trees for every casket the company builds. In 2012, the Northwoods Casket Co. helped sponsor a 175,000 tree planting in the Kettle Moraine State Forest Northern unit near Sheboygan, Wisconsin. Since 2010, the Northwoods Casket Co. has annually selected 3-4 communities in the state to sponsor urban tree plantings under the guidance of the Wisconsin Department of Natural Resources Urban Forestry initiative. Through the company’s program trees have been planted in villages and cities large and small, in public parks, on public school grounds, street terraces, and private property. “I’ve seen a lot of creative tree-planting programs, but this one—a casket company giving back this way—is very unique,” expressed Jeffrey Treu UFC member and resident of Waupaca, Wisconsin. The company, founded in 2006, builds sustainable, eco-friendly caskets and delivers to every funeral home in the state of Wisconsin with next-day delivery service. The company builds a wide selection of caskets in 30 styles and finishes suitable for cremation or burial in prices ranging from $500 to $5,000. For more information go to www.northwoodscasket.com or call (920) 631-7077. Beaver Dam, WI. 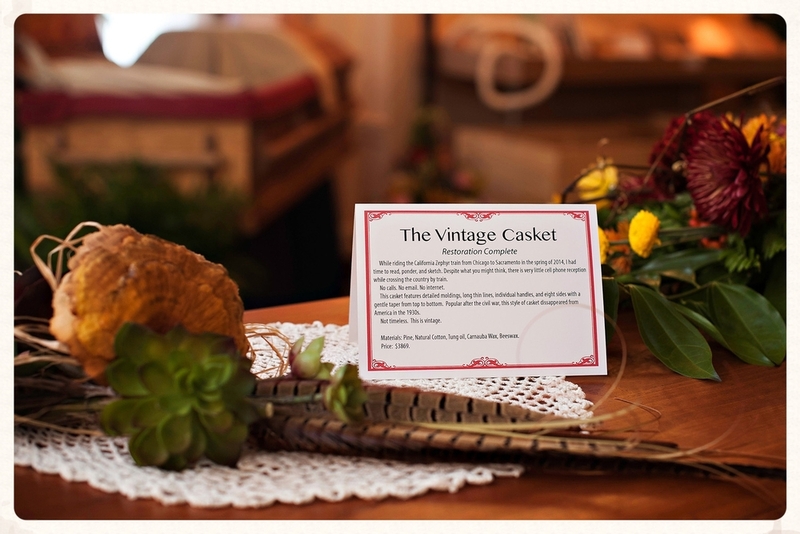 On Saturday, September 20th, from 11am-5pm, the Northwoods Casket Company is hosting a Grand Opening event at their new casket gallery and furniture store located in the former Koepsell-Murray funeral home property at 109 N. Lincoln Ave. in Beaver Dam, Wisconsin. The 10,000 square-foot funeral home will serve as the casket builder’s headquarters, workshop, and gallery. The accessible ground floor will exhibit more than 30 casket styles, colors, and personalized options all available for purchase through local funeral homes. Additionally, the gallery will sell home furnishings by the company's new brand, Carriage House Works. The 5000 square-foot remodeled basement will serve as workshop space for both finishing and upholstery activities, while all woodworking activities will continue at Northwoods' multiple other workshops around the state of Wisconsin. “The gallery is a game changer for us,” says Jonas A. Zahn, founder of Northwoods Casket Co. “For almost ten years we have sold caskets nationwide through catalog sales to funeral homes,” says Zahn. “This gallery will help build local demand by making it possible to display one-of-a-kind, themed, and personalized caskets for local delivery.” The casket builder delivers to every funeral home in Wisconsin with next-day white glove delivery service. “This is a fantastic idea,” says Russ Koepsell, “and a very fitting use for this funeral home that served our family business for so many years.” Beth Koepsell-Zeamer has already started sending families to select a casket, cremation casket, or urn that suits the family and says, “the family was very happy to be able to just come on down to our former location and select something that is both local and personal." Northwoods Casket Co. has built a casket business primarily focused on Wisconsin funeral homes. The company is committed to sustainability by crafting caskets from locally sourced, sustainable woods adorned with non-toxic paints, natural oils, and VOC-free natural wax and oil wood finishes. Casket interiors are made from biodegradable, organically grown natural cotton, and other environmentally friendly fabrics made from hemp, flax, and wood pulp. Styles range from historic to contemporary at prices ranging from $500 to $5000 with most models below $3000--the average price paid for a casket in the U.S. Above all, founders Jonas and Julie Zahn have committed to plant 10 million trees in their lifetime and plant 100 trees for every single casket the company builds. “Planting trees is a core element of our business. Planting 10 million trees is more than a commitment to the good people of Wisconsin—it is a promise I have made to my two children,” says Jonas Zahn. Carriage House Works is the company’s new brand that sells Arts & Crafts period furniture, steampunk and Edison lighting, reclaimed lumber, vintage wood flooring, milk paint, natural oil finishes, and vintage lamp parts. Handcrafting home furnishings is a natural extension of casket making and vice versa. Historically, caskets were made by local furniture makers. “We love what we do--crafting fine things from wood, using natural oil finishes, borrowing techniques mastered in 16th century England, and bringing both quality and beauty into the home." Everything in the gallery is made from locally sourced materials by the hands of local artists with sustainable and eco-friendly products and techniques. For more information visit the company online at www.northwoodscasket.com and www.carriagehouseworks.com. The gallery features fine handcrafted caskets, furniture, and photography art on canvas. Beaver Dam, WI. The Northwoods Casket Company recently acquired the former Koepsell-Murray funeral home property at 109 N. Lincoln Ave. in Beaver Dam, Wisconsin from the Koepsell family. The gallery will be open to the general public with a grand opening event on Saturday, September 20th, from 11am to 4pm. The 10,000 square-foot funeral home will serve as the casket builder’s headquarters, workshop, and gallery. The accessible ground floor will exhibit more than 30 casket styles, colors, and personalized options all available for purchase through local funeral homes. Additionally, the gallery will sell home furnishings by the company's new brand, Carriage House Works. The 5000 square-foot remodeled basement will serve as workshop space for both finishing and upholstery activities, while all woodworking activities will continue at Northwoods' multiple other workshops around the state of Wisconsin. Northwoods Casket Company recently acquired the former Koepsell-Murray funeral home at 109 N. Lincoln Ave. in Beaver Dam, WI. Growing market for sustainable “green” caskets calls for new skills in casket building. Beaver Dam, WI - Northwoods Casket Company, a Beaver Dam based casket builder, welcomed Sally Cupery to the team in March as a full-time seamstress and interior designer. Sally brings more than 40 years of sewing and design experience to the team. According to owner Julie Zahn, "Sally's creativity and expertise is invaluable, specifically in working with our unique fabric interiors that include organic cotton, cotton/hemp blends, and Lyocell." Sally joins founders Julie and Jonas Zahn, casket builder Jack Rhodes, delivery driver and shop manager Jim Zahn, and a dozen part-time team members at the company’s quaint casket shop located in downtown Beaver Dam, Wisconsin. "Working with fabric gives me the opportunity to do something I really enjoy while being part of a process that results in a beautiful and unique casket or burial shroud for a family,” Sally shares. Northwoods Casket Company builds sustainable wood caskets using locally sourced lumber and local craftspeople. Founded in 2006 by Jonas and Julie Zahn of Beaver Dam, the company's caskets are sold by more than 250 funeral homes in Wisconsin and throughout the Midwest. They plant 100 trees for every casket they build and won the 2013 award for "Innovator of the Year" from the Wisconsin Urban Forestry Council for their creativity and commitment to planting trees in Wisconsin. More information can be found online at www.NorthwoodsCasket.com. Jonas Zahn, founder of Northwoods Casket Co., said he has always been interested in recycling, repurposing and sustainability. His caskets, like the metal-free Simple Pine Box, are made with Wisconsin-sourced wood. In 2004, when Jonas Zahn’s grandfather died, the family couldn’t decide between cremation and burial. Cost was a significant factor for the thrifty farm family, so Zahn volunteered to work with his father and sister to build a cowboy-style casket reminiscent of the old Westerns that his grandfather loved. “It was the first time I had ever thought of making a casket,” Zahn said. That very moving shared family experience inspired Zahn to start his own company providing simple pine boxes and environmentally friendly wood caskets for families who wanted choices. Today, Northwoods Casket Co., based in Beaver Dam, markets to about 200 funeral homes in the Midwest.